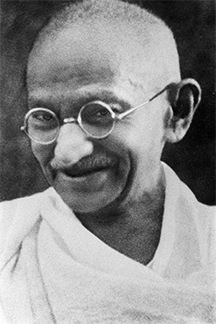 Mohandas Karamchand Gandhi (1869-1948) was the leader of the Indian independence movement in British-ruled India. Using only the methods of nonviolent civil disobedience, he led the people of India to independence. His leadership has since inspired successful movements for civil rights and freedom worldwide. The apparent impossibility of achieving the goal of Indian independence, and other goals subsequently achieved by others employing Ghandi's tactics, probably accounts for some of our belief in the effectiveness of nonviolent civil disobedience. The photo, which dates to the 1930s, is courtesy Wikipedia. As a reminder, last time I began exploring what happens in meetings when people experience a pattern of disrespectful interruptions by one of their peers. I've been using the term chronic peer interrupter to denote the person who does the interrupting. In this Part II, I examine some less effective but nonetheless common tactics people use to avoid being interrupted — or to respond to interruptions — by a chronic peer interrupter. Several tactics belong to a group one might call retaliatory. The theory underlying these tactics is that by treating chronic peer interrupters the way they treat others — that is, disrespectfully — the experience will provide them insight that could lead them to treat others more respectfully. That's why retaliatory tactics tend to be more effective when the interrupter is a well-meaning individual who got a little carried away. For chronic interrupters, though, interruption is often an intentional power or dominance display. Because they're well aware of what they're doing, they need no illustrations, and retaliatory tactics are unlikely to lead to permanent improvement. Scout waits for Indigo to finish or pause, then ignores whatever he's said. Scout resumes, "As I was saying…" This approach is appealing to many, because it avoids what some call "stooping to their level," by honoring the social value its users are trying to propagate: respect for others. or dominance displaywon't deter the seriously capable chronic interrupter. For example, when Scout resumes her contribution, Indigo can just interrupt her again. And because that option is available to Indigo every time Scout tries to resume, Indigo can use it repeatedly. Typically, when Indigos do this, Scouts just give up. Upon Indigo's interruption, Scout says, "Excuse me, I was talking, may I finish please?" Or, "I listened while you spoke, now would you please listen while I speak?" This approach, again, is appealing to many, because it's consistent with the social value its users are trying to propagate. One risk of this approach is that it places Scout in a subordinate stance, asking for permission from Indigo, or asking to be excused for speaking uninterrupted. A more powerful stance, for example, is, "I wasn't finished, Indigo, but if you can wait for a moment I'll finish shortly, and then you can speak." Such a tactic asserts that only Scout has the power to determine when Scout is finished. It inverts the power game, albeit at some risk of tension. Upon Indigo's interruption, Scout keeps right on talking. One option is repeating the last sentence again and again until Indigo is silent. Another option is to say, repeatedly, "Stop talking please, I have the floor," or something similar. Or some try sarcasm: "Excuse me for talking while you're interrupting." People who try overtalking tend to escalate in volume, in some cases approaching the level of shouting. Some Indigos respond by escalating their own volume. Both look silly to onlookers. When Scout speaks at a normal level, and Indigo begins to shout, the result favors Scout. As Ghandi once said, "Nothing is so aggravating as calmness." So before trying this tactic, practice talking at a normal voice volume level while someone else tries to interrupt. See "Overtalking: I," Point Lookout for October 16, 2013, for more about overtalking. Scout decides to interrupt Indigo. When Indigo demands respect — for example, employing the asking-to-finish tactic — Scout says something like, "Now you know how it feels," or, "You don't deserve respect, because you're always interrupting everyone else." This form of retaliation is unlikely to produce an immediate positive outcome. It assumes that Indigo will demand respect, and it therefore fails if Indigo responds by overtalking or by plowing right ahead, as described above. It risks escalating the situation into openly toxic conflict. But its fundamental weakness is that uninvited advice is rarely heeded, and Indigo hasn't requested instruction, counseling, or advice from Scout. Anything positive that comes of this tactic might arise from making peace after the eruption of destructive conflict. In ordinary conversations in meetings, innocent interruptions do happen. People get excited, and they sometimes forget their manners. Most groups can deal with such incidents easily, by reminding themselves to be polite with one another. Use retaliatory tactics with care, and in combination with support from allies. Would you like to see your comments posted here? rbrenDnpehdhfyKklzyhSner@ChacVhPVRqtlSEoihtSSoCanyon.comSend me your comments by email, or by Web form. I offer email and telephone coaching at both corporate and individual rates. Contact Rick for details at rbrenEGcytiWpkcwJXJqjner@ChacVjuNrbWCBkxtLaUvoCanyon.com or (650) 787-6475, or toll-free in the continental US at (866) 378-5470.